I wonder what Mette-Marit said. Guillame is really laughing. Geez Mary was telling quite the story lol. Love the facial expressions. i think from the website they put rania and k.abdullah sooo far apart. its funy she was on her phone outside i wonder if shell tweet this? Do they all speak in english to each other? Yes Rania has a twitter page. 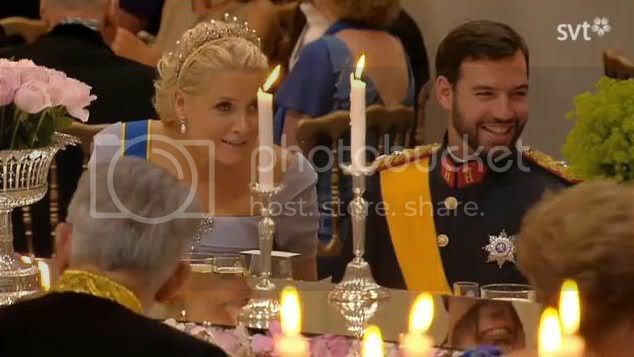 Closer up, Mette-Marit & Sophie seem to be having a funny conversation. Guillaume was laughing a lot! I wish I had gotten a still of Mette's funny face! Husbands and wives are never seated together at dinner parties etc. Can't imagine why Rania is on the phone as it is too late for the oter kids to be up? Seriously, why aren't they eating? I wan't to see the dancing already....and sleep.. Yes they speak English. Since it's a common foundation for them all. Actually, Guillame is from Luxembourg....not Lichtenstein. I think it was Guillame, and Sophie of Lichtenstein. Who was the woman with that stunning amethyst tiara, similar to the swedish one, but it went all the way round. Sorry I was not clear, I simply meant that Sophie was from liechtenstein, so people would not think I was talking about the Countess of Wessex. Oh no, did I hear/understand right... They just said in Swedish that they can't film and show the wedding waltz? Otherwise, wonderful wedding. My first royal wedding that I'm following live. No problem Gomnatt....Luxembourgs Guillame is sitting right next to MM. Theres another Guillame there? I remember a picture of King Constantin and then princes Rania at one of the Spanish weddings. They're quite at ease with each other. I also wonder what Madeleine and King Abdullah are talking about. I love her necklace by the way. Mette-Marit's hair and tiara a just stunning. Her makeup is perfect.